Lodged at the end of Lumber Street in Salisbury, N.C., is a classic brick-and-mortar structure with varnished hardwood floors because that’s the way they built lumber mills a century ago. 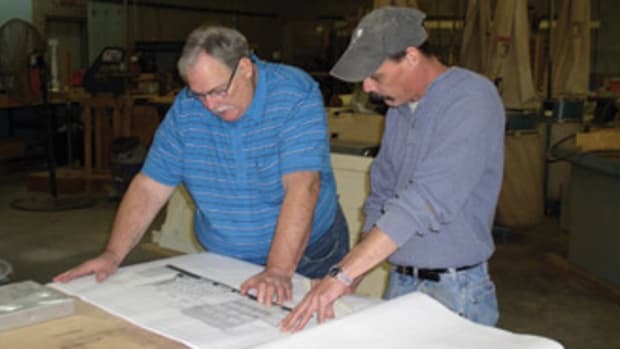 Home to Goodman Millwork Inc., it still stands as a sturdy, steadfast symbol of a family-owned enterprise that has survived every up and down, from the Great Depression to the recent Great Recession. “Yes, we’ve been in business over 100 years and we’re not even close to dying of old age,” quips owner and president Franco Goodman. “It was my grandfather and his brother who laid the groundwork and set the highest standards that guide us today. Then my father and his generation of Goodman boys picked up the ball and preserved this company as envisioned by its founders. Our story includes sons, sons-in-law, nephews, grandsons and great-grandsons. Seems there may be something genetic in our ability to survive and thrive.” With the addition of Goodman’s two sons, the company is among a scant 3 percent of U.S. family-owned businesses still operating into the fourth generation. Nick, Franco and Ben Goodman Owners of: Goodman Millwork Inc. 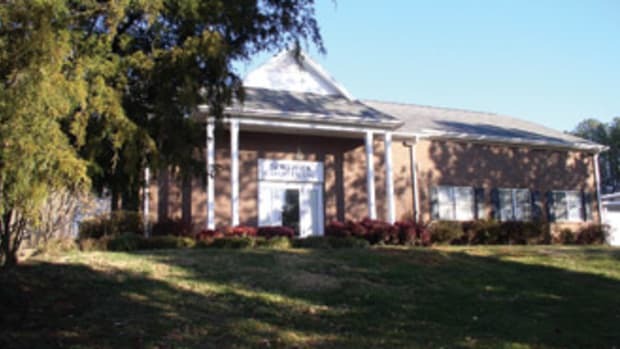 Location: Salisbury, NC Shop size: 47,000 sq. ft. Employees: 20 Years in the business: 30-plus Approximate yearly gross: $2.5 million Business focus: High-end residential and commercial millwork Other equipment: Dependable 12” joiner; Delta 16” joiner; double-sided planer for skip dressing rough lumber; Wadkin rip saw; Buss 24” and 36” planers; Biesse sander; Altendorf sliding table saw; Weinig Unimat 19” molder. 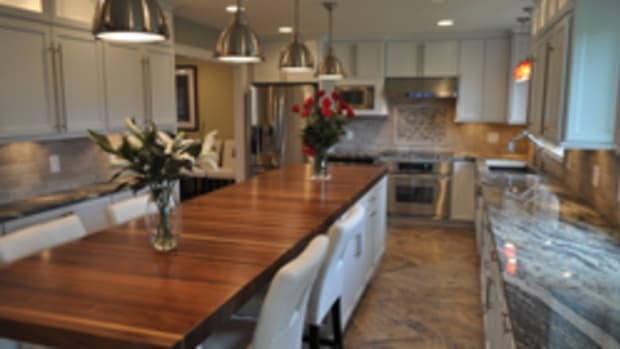 “Probably the biggest reason we’ve continued into the 21st century is the wide geographical distribution of our custom architectural cabinets and millwork,” says Goodman. 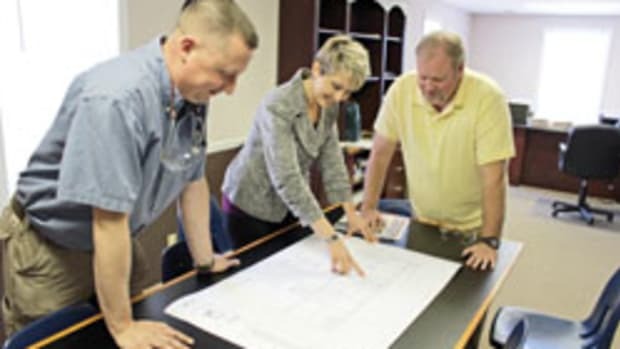 For years, the company has built long-standing relationships with contractors, interior designers and architects all across North Carolina from the mountains to the coast and to adjacent states. 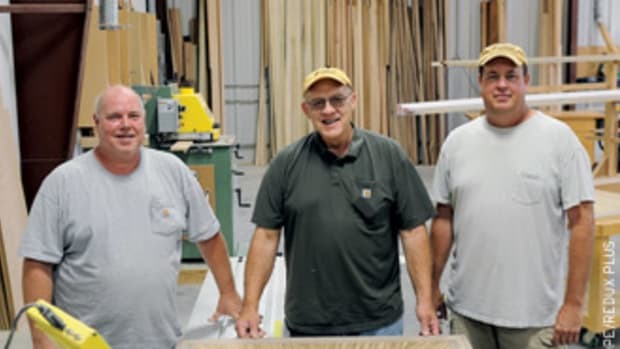 Franco Goodman, the third generation in the family, started working at Goodman Lumber Co. back in the 1960s at the age of 14 and learned the basics about wood and running the business. After graduating in business from East Carolina University in Greenville, his father, Myron, who had associated with the company his entire life, suggested he launch out on his own for a time. “He wanted me to find out what it was like working for someone else,” Franco says. So Goodman worked five years in banking and as an industrial engineer for a textile company. In 1982, at age 33, he purchased all the outstanding shares of the woodworking operation and became president. Under his direction, the corporate structure was reorganized and lumber and building supply sales were phased out. All the emphasis was placed on architectural woodwork and in 1992 the company was renamed to reflect the true nature of Goodman Millwork Inc. So he’s the person a client initially talks to about a new project. However, he might be flanked by his two sons who have joined him in preserving the Goodman legacy. Benjamin “Ben” is 35, a North Carolina State graduate in forestry and now shop manager. Nicholas “Nick,” 32, served in the Army, with a tour of duty in Iraq, and is manager of F. E. Goodman Construction, a subsidiary started by his father to broaden the base and to better control product installation and quality of work. But quality control is just one aspect of this business. Volumes of paper stacked neatly in piles almost cover the conference table. They’re visual proof of the time and diligence Goodman puts into analyzing each job, an assignment he assumes with attendant comfort. From the early 1900s, the lumber business became a lifelong career for the Goodmans. The family farm couldn’t generate enough work for four brothers, so Enoch Goodman, Franco Goodman’s grandfather, went to town and found a job at the sawmill. Anxious to be independent, he and a brother, Linus, cobbled together a portable wood-cutting contraption, hooked it up to their mule and toured the county, buying and cutting timber. 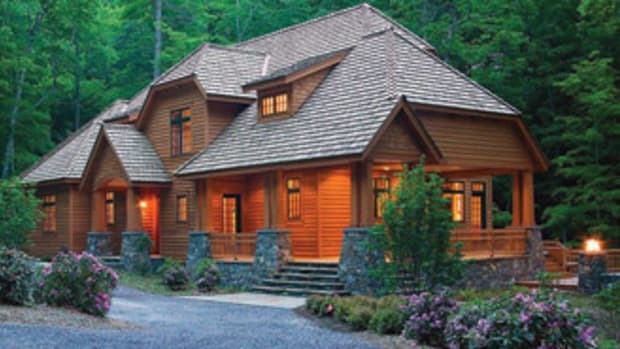 A steady supply of hardwood from nearby forests in the eastern part of the state and a continuous demand from the burgeoning North Carolina furniture industry kept them busy. “That old sawmill had a magnetic power the Goodman boys just couldn’t resist,” Franco Goodman says. But in time they had to defer to their wives who became fed up with living in shacks wherever they parked the saw. They settled in Salisbury and built the present brick retail facility adjacent to their homes near the railroad tracks. 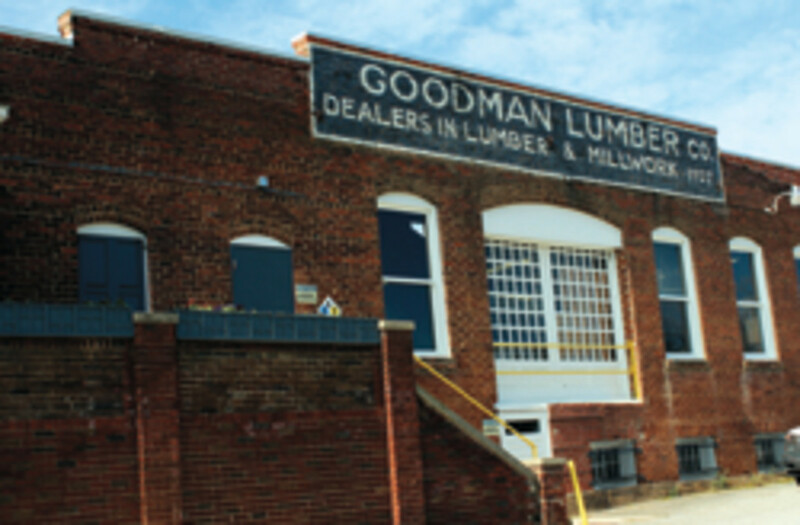 In 1907, Goodman Lumber Company opened for business. It was the big-box store of its time and touted, “Everything for the builder, from the foundation to the roof.” To increase revenue, they expanded into real estate, bought land, built houses with their lumber and supplies and realized hefty profits when they sold them. The company and Salisbury grew together. Just inside the front entry to the sprawling plant and on both sides of a long hardwood corridor is a row of mostly vacant offices defined by wood-framed glass windows. The retro scene is reminiscent of bygone days when the labor force reached 60 in the 1970s and ’80s. Through the years, the number of employees remained stable before the economic downturn at the end of 2008. Some of the offices are filled by core employees, the backbone of the company and just as important as the wood that goes into every job. “It always comes down to the employees.” Besides Franco, Ben, and Nick, there’s Carla Anderson, accountant and gal Friday, who tends the books, fields telephone calls and greets walk-in customers. Down the hall Mike Keene sits at his computer generating CAD designs. He joined the company more than 20 years ago and is the person who introduced Goodman to computers. Keene can readily take a napkin drawing and translate it into workable plans. 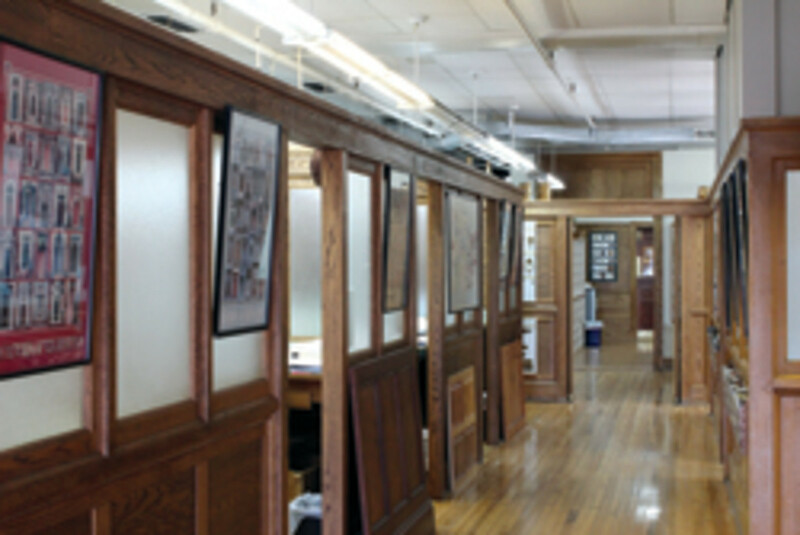 Before Keene and computers arrived on the scene, more than 25 percent of business was designing and building mock showrooms for furniture galleries. That business extended from the High Point area to California, Canada, Mexico and also Saudi Arabia and Germany. The challenge was to create showrooms that looked like authentic home settings. “We had to keep it simple so backdrops didn’t detract from the furniture,” says Goodman. Then, in the 1990s, the furniture industry suffered a major downturn and almost all the manufacturing went to China. 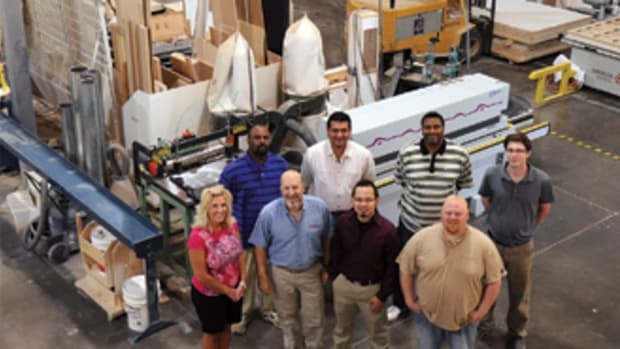 Goodman flexed its business muscles and picked up the slack in new directions — high-end millwork for homes, churches, institutions, and businesses. It won specialized contracts for companies like Rangoni Shoes to design, construct and install storefront entrances from Charlotte to San Francisco. Goodman also launched into historic preservation. The company was hired to do a complete renovation of the circa 1700-1800 dorms at the University of North Carolina in Chapel Hill. It replaced and matched, for an authentic appearance, all the millwork including, floors, windows and cabinets. 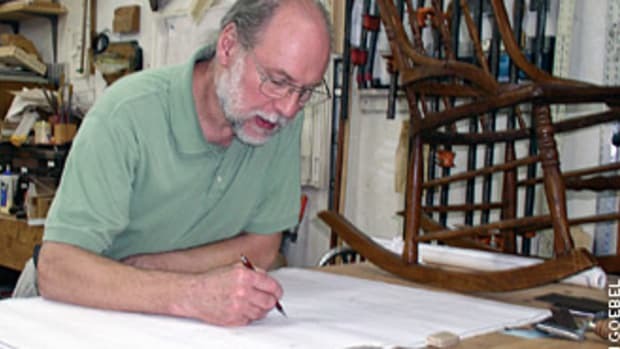 For any restoration, Goodman’s molding gallery presents hundreds of patterns collected through the years. 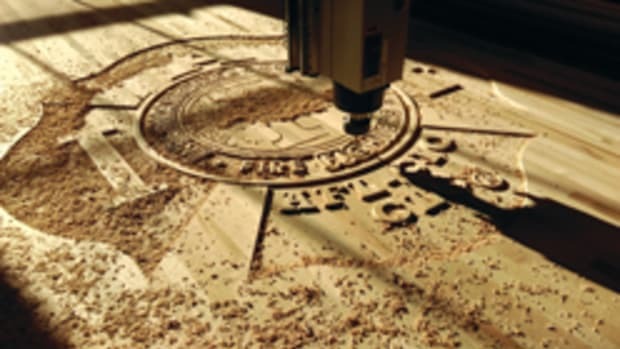 Again, it’s much easier to make the shapes today with the CNC’s many capabilities than it was in the days of jigs and hand tools. However, even now if they don’t have the tooling they need, they might grind a knife or two. When Goodman Lumber Co. opened for business in 1907, the Industrial Revolution was a driving force toward mechanization. Follow the Goodman story and a history of woodworking tools and techniques unfolds. Products were being forged to replace hand tools and block planes. 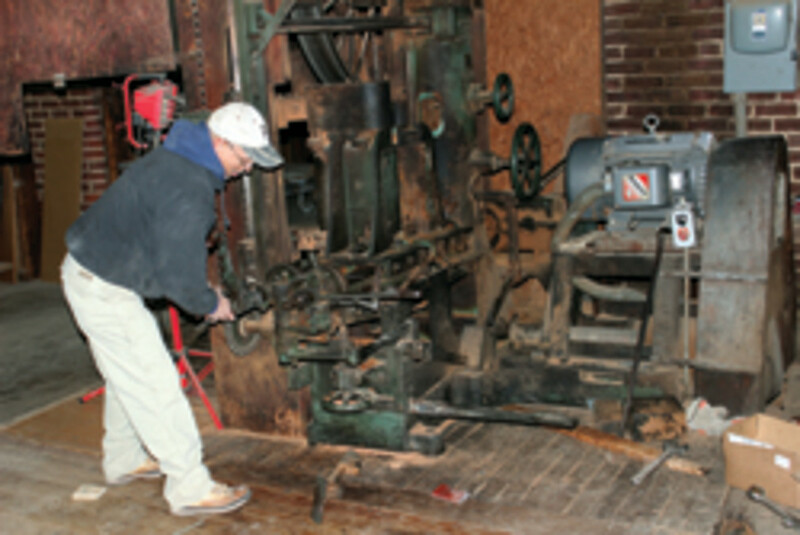 There were new machines making it easier to cut and saw lumber thanks to the steam engine. 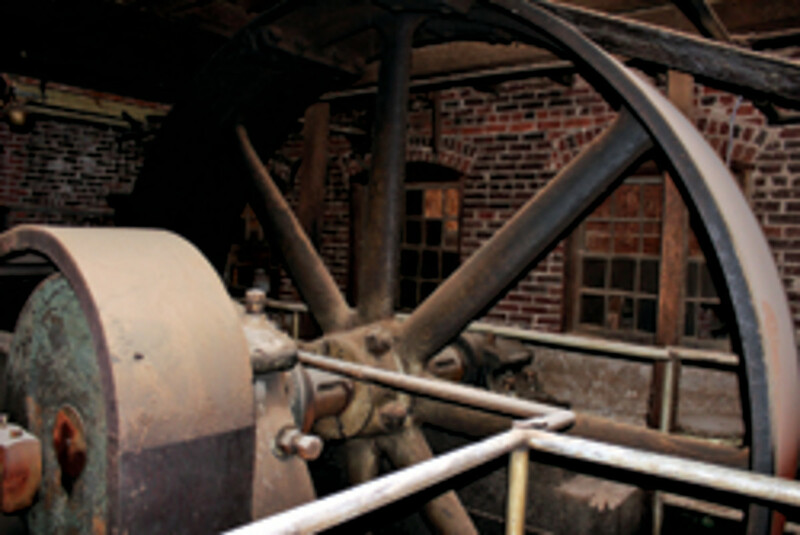 A 1920s era Hardie/Tyne steam engine kept machines humming. Now it’s a permanent fixture resting in a catacomb beneath the deck. Slots in the floor at machine stations still show how steam-engine-powered gears and belts connected to various machines kept the shop up and running. It’s a relic the likes of which is rarely seen, perhaps only in the Smithsonian. It was retired in the ’70s when safety codes mandated electricity and new equipment demanded high speed and greater horsepower. The plant was heated by a hand-fired boiler until five years ago. It was a loveable albatross that burned all the waste products from the plant. Now the shavings, chips and scraps go to a nearby horse farm. Still being used is a 1920s McDonough reciprocating resaw, which, in its day, helped speed processing of lumber for the furniture market. Tony Rickard, the Goodman’s maintenance man and jack of all trades, keeps busy repairing the behemoth. This day he had extracted a pile of parts and the band saw blade to get to a frozen gear. “If you can fix this, you can fix anything,” he says with a smile. Now there is a push to retool and purchase top-of-the-line machines. 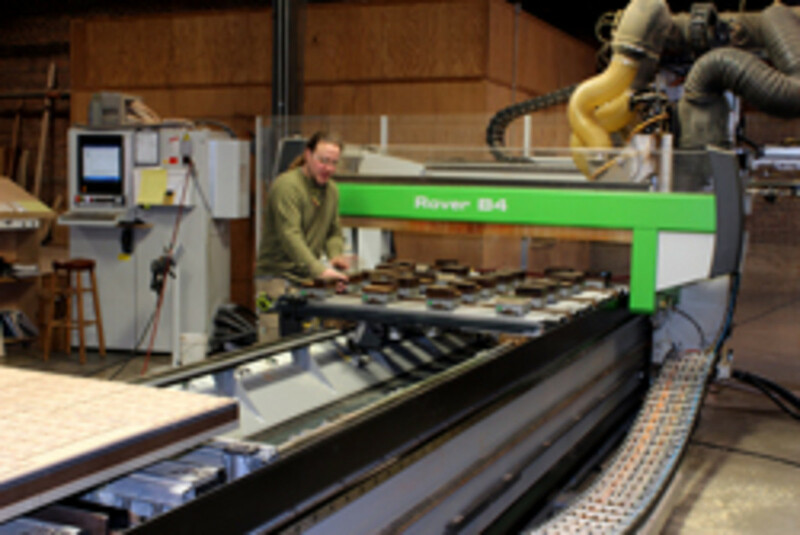 About five years ago, just before the recession, Goodman bought a Biesse Rover B4 CNC. David Arnold is the chief operator. He learned his skills at another job and expanded his knowledge through hands-on experience at Goodman. He says the secret to his success in running the machine is to listen to it. “Every sound it makes tells me if it’s doing what it’s supposed to.” There are dozens of operations it can do, but only one person is needed to run it, so it eliminates the need for more employees. One example of a Goodman customized walk-in project can be found in a town near Charlotte where a dentist desired a dedicated theater in his expensive new home. He had decided on the look of a classic English pub, sketched out what he wanted and took it to Goodman Millwork. The company fabricated, finished and installed all the mahogany woodwork and equipment cabinetry. Besides finding capable personnel, late delivery of lumber and supplies can be a big setback. “Our business is nothing without wood,” observes Ben. “It may account for 50 percent of the total cost of any job. We depend on it being readily available. We buy most of our poplar locally and go to Baltimore for cherry and sapele, which we use a lot. For the most part, lumber prices have stayed about the same the past couple of years.” No problem with storage. The company uses the original Lumber Company building from the early 1900s that now features a modern sprinkler system. “Whenever there are glitches, in the end you have to depend on the customer’s understanding and that has to be made clear up front,” says Goodman. Now 63, Goodman is also thinking about keeping the business in the family the way it’s always been. It seems he has a good start toward that goal as he guides and nurtures his sons, the fourth generation of Goodmans.